Marketing materials arriving in stores is always a good sign that a device may be semi-close to a release. 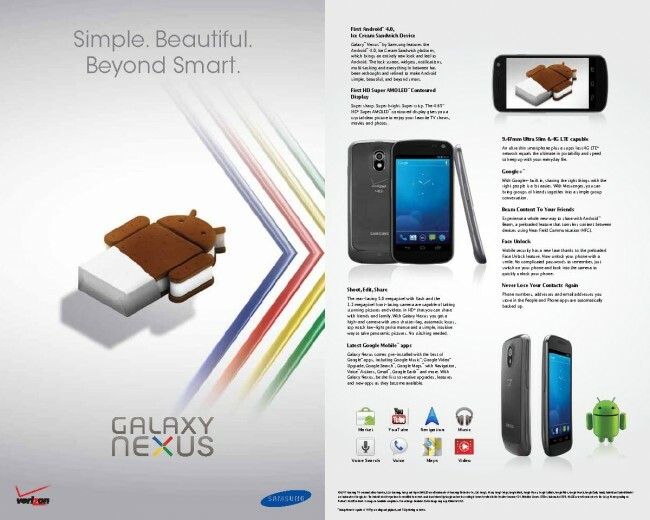 According to an employee from a 3rd party Verizon shop (the non-corporate kind), these two posters showed up in the last day to help promote the highly anticipated Galaxy Nexus. The timing couldn’t have been better, seeing as how Google gave us every last detail this morning for the 4G LTE variant of their latest and greatest smartphone. Almost makes you think that the phone was originally scheduled for a November 17 after all. What does this mean for a release as of today? Well, we have no idea. The GSM version is available all over Europe right now. We have heard that November 21 is one of the many possibilities here, however, the latest word from our sources suggests November 28 is the earliest. The 19th is supposed to be the day that this round of testing is completed, and if all passes, we could be ready to go. This whole situation is a mess. Again, as we say every time, none of this is official until Verizon makes it official. In fact, it’s pretty clear that no one knows at this point. Look at the HTC Thunderbolt and the 18 delays it ran through while last minute bugs were worked out. I’m not suggesting that will happen here, but if Verizon, Google and Samsung want this phone to be perfect at launch, we don’t know how long it will take to get it ready. One thing I think is certain, the LTE version hasn’t been finalized or the old standard tech sites that received review units yesterday wouldn’t have been handed the unlocked HSPA+ version. Or as some have suggested, maybe they just sent those out to coincide with the Euro release of the phone? This phone is giving me a headache.